As sophisticated as it is easy to use, this HD digital camera is specifically designed for microscopes. It provides high-resolution digital imaging as accurately as a complex computer-based system without the expense of the computer. 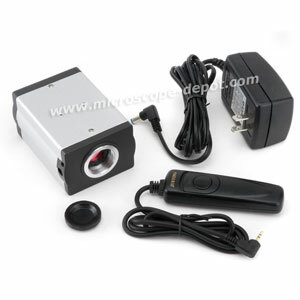 Yet it also offers the convenience of a traditional CCTV video camera. This versatile camera is perfect in a variety of settings including, but not limited to: high-throughput inspection stations, Q.A. and Engineering labs, conference rooms, or anyplace you need to quickly and easily manage your imaging workflow. The images of the observed target can be accurately displayed and captured without having to make room for, or maintain, a computer. Users can easily view the high-res live image and then, if desired, freeze and capture images directly onto the SD card provided. It offers the same quality as a USB or firewire camera with none of the headaches, enabling you to capture a photograph with a simple click! This camera offers a high frame rate -- a remarkable 30 frames per second (fps) -- which produces smooth-flowing video. And its 1.3 megapixel (1280x1024) resolution ensures that every image is crisp and detailed.